Asahi Kasei Medical Co., Ltd. is pleased to announce the commercial launch on June 17 of Planova™ BioEX, its new generation of hollow fiber membrane virus filters. 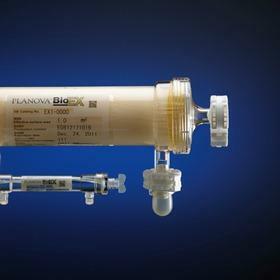 Planova™ BioEX filters are specifically designed to meet the urgent need in downstream biopharmaceutical processing for robust virus filters that not only enhance safety, but also have higher filtration capacities and shorter processing times, even under demanding filtration conditions such as high protein concentration and high filtration pressure. Developed using Asahi Kasei Medical's unique technology base in cellulose hollow fiber virus filters and polymer science, Planova™ BioEX filters incorporate a durable hydrophilic PVDF (polyvinylidene fluoride) hollow fiber membrane, enabling them to cope with the harsh processing conditions typical of state of the art biopharmaceutical manufacturing. Using Planova™ BioEX filters, it is now possible to safely and efficiently filter large volumes of high protein concentration solutions, which are typically problematic for traditional types of virus removal filters, particularly those with flat membranes. Optimized for filtration under high protein concentrations. Suited to high pressure filtration. SIP (steam in place) compatible. Superior validated virus filtration performance, even with small parvoviruses. Various filter surface area sizes, making for easy scale up or scale down. Asahi Kasei Medical is the global market leader in virus filtration products. Cellulose hollow fiber Planova™ virus removal filters from Asahi Kasei Medical have an unrivalled 20 year history of trusted use in the production of biotherapeutics, and Asahi Kasei TechniKrom, Inc. (a wholly owned US subsidiary of Asahi Kasei Medical) offers an innovative line-up of equipment solutions for bioprocessing, including chromatography equipment, in-line buffer dilution systems and virus filtration and integrity test skids.